i'm loading up on the blogs today because I was inspiried on my drive home. Inspired meaning, I had a hard day and was thinking about all the ridiculous things about my job. I got an email from my friend today talking about how she'd cried on her jobsite. In my head I said, "oh yah, that's happened to me before. It's been awhile. I guess, though I'm stressed, I'm learning how to do this thing." .... 10 minutes pass. I send an email back saying "yah, work is super busy right now. Yuck". Enter phone call from a disgruntled subcontractor on top of my 1:00pm deadline. The last time I cried on my jobsite, I was having a personally hard day and, coupled with frustrations at my jobsite, I burst into tears in front of ten scaffold erectors. It was over two years ago. Today, my subcontractor accused me of dirty dealings. I knew I hadn't done what he said I did. And I don't know if he understood the whole story. But I was so overwhelmed with all the other work i had to do, I wasn't going to stand for someone being grouchy. So I argued with him, and then I burst into tears. I think he knew after the long pause that I was emotional. Upon return to my nornally scheduled programming (procurement log, folks), my boss asked for an update on the conversation. I couldn't answer, I was so frustrated, and beat up. I couldn't answer and thus, burst into tears again. My boss kindly ushered me into our break room where he offered me a turkey sandwich, over which I told him of my woes, and of the mean subcontractor. He said we could invite them over for a discussion and fix it all tomorrow. I sat chomping on my sandwich like it was my long lost security blanket. We all cry at work sometimes. Usually its a combination of many factors. And usually, it comes upon me without much notice, like in the middle of the phone call today. We are all, just.... normal. The doctors at my jobsite arrive at the same time I do each day. We both have the lives of the patients on our minds, and on our insurance books. We both have stressed-filled days. Sure, they work with scalpels and I work my keyboard (which sends money to men to work a screwdriver). Sure, they worked their way through an awfully hard curriculum and residency and fellowship. Sure, they have eight or more years of dept from Medical school to pay off. But at the end of the day, I am working the same hours, for a similar stress, for a 1/3 of the pay. They get to save lives and have options for flexible work. So, if I had to go back, I think I would have been a doctor. Check out the oompa loompa (center of screen). Operating Room suite remodel is in planning. I had to work much later than I planned on today. Two hours turned into 6 hours and with it, out went the ability to be ahead of the game for my dinner. Thankfully, I work near Portland’s Farmer’s Market and was able to sneak away and buy ingredients for the evening. If I have learned one thing about cooking, it’s that if you are good to your food, it is good to you. Tonight was one of those nights where I had to go with what was easiest. I had to choose not to over think and do less to each dish. There was no prep time before people got there, no time to layer ingredients, no time to chop excessively and use 25-part recipes. With the high quality produce I bought at the market, I had very little to do. I added very little to the asparagus, new potatoes, mixed greens (mixed myself) and strawberries but the flavors were excellent and once plated, the dinner reminisced of restaurant fare, minus the sauces and garnish. Appetizers- the poor guests really didn’t get any. I fell down on this and pulled out already once-used cheeses (assorted- blue, brie, and one other- don’t buy cheese at Albertsons) and rice crackers. My co-worker was hungry and this had to suffice. Plus, I needed last minute help with the new BBQ I bought so on top of no appetizers, I made them work for their dinner and set it up so I could cook the main course, which was…. Salmon rubbed with orange zest, brown sugar and salt, then grilled with sweet onions & basil. My uncle, whose recipe this is, suggests grilling it on a cedar plant, which really is the best way, but in the rush, I didn’t soak the cedar plank so we did without. I thought this is a very flavor-rich recipe for the salmon, but I needed to go a little lighter on the salt than what the recipe called for. I doubled the rub because I had so much salmon but probably didn’t need to. A little goes a long way. Salad- Like I said, I bought three kinds of lettuces and mixed them myself- butter lettuce, red leaf and frissee. It was a good mix. I did two parts olive oil, one part vinegar in the bottom of the bowl with ample salt and pepper and pre-tossed the lettuces before I plated and then added beets (boiled and chopped roughly), goat cheese and home made croutons. The croutons were more popular than the beets, which colored my hands red in the process of chopping. They don’t have a repulsive flavor and they aren’t pickled like I remember them as a child. A good sub for color if tomatoes aren’t in season yet. I loved the salad, which was well balanced. Asparagus and New Potatoes- Asparagus was super fresh and sautéed to a nice bright green. Just a little salt and olive oil, which I never know how much to add. It often seems like too much, some veggies absorb more of the oil than asparagus. I roasted the potatoes and included garlic with the olive oil, salt and pepper. I minced the garlic and rubbed a little over each potato so not one got too much. It worked well. Sometimes garlic can get overwhelming. My dinner guest Katie brought homemade olive bread that was to die for. I am going to grab her recipe on this. She said it was so easy, and I believed her. It tasted like it was professionally baked. We did white wine for drinks. We made it through two bottles, which was fun and surprising to me. It went well with the salmon. Of course, without a killer appetizer, we had to do something with our hands. I am trying not to apologize for my dinners- there are always things I can improve. I have had enough well prepared meals in my time to judge myself on a high standard. I read that the cook should never apologize, but I just can’t help it. But I am trying to be better. Really. Tonight, I felt like the potatoes were a tad soft or overcooked. Not brown, just soft. This was probably because the sizes weren’t the same. I did my best to even the playing field, but still had inconsistencies which bothered me. I already mentioned the salmon was a bit salty and the recipe wouldn’t work well for a salmon purist. However, it does add such good flavor that most people are sure to like it. The other big oops is that dinner wasn’t ready when people got there- and so I put them to work. There is some benefit to doing that- standing around with only wine in the hand can be a slow start to conversations, especially if I am running around preparing food. And so, I liked that we all were working together on the finishing touches. So I guess that negative just turned into a positive. I think of my dinners like I have learned to think of schedules at work in the construction industry. There are the ‘long lead’ items that need to be started first. Usually, they are my least favorite piece to do and are much less creative but also the most important- like preparing the salmon so it will marinate. The key to my dinner tonight was that my longest long lead item was two hours- the rub for the salmon. My preferences at dinner trend towards the veggies and the salad. If I can nail those, I like my dinner. But the opposite is really true for dinner guests- they need the meat nailed. So first on my list was the salmon. Then, I needed to boil the beets. I got those going and then prepared the short cakes for dessert. I missed setting the timer, and was so surprised that the beets smelled so sweet as they were boiling! Instead of sweet beets, I got burned shortcakes. While my long leads were sitting, boiling and burning, I flew about the house straightening and lighting candles. I had leftover votives from the holidays that I used in mason jars. I love mason jars and put everything in them. My table was a huge success in my opinion. I have done fancy tables before, but I love simplicity and tonight I think I nailed it. I have burlap that I used as a runner on the table and then set out little tiny vases (just two) with deep red runiculas and two votives. In the center, I had a larger mason jar with bright pink peonies. To add a little elegance, I have champagne chargers that were under my plain white plates. I even had to use paper towels for napkins! But, it was fresh, clean and uncluttered and it worked well. I wish I had gotten a photo. I had wanted to take my extra leaf out of the table but didn’t have time. But it worked out because it was nice to have extra space at the ends of the tables to put the serving platters. I had plated the salads and the rest we ate family style. Finally, for dessert, we did fresh strawberries from the market over the shortcakes (which I cheated on with Bisquick) and real whipped cream. They were huge portions but everyone licked their plates. The strawberries didn’t need sugar. They were perfectly sweet and ripe. Nothing in the world beats these strawberries. This is why I love Oregon. I also served coffee with the dessert, which is why I can still write this recap after dinner and dishes. My Major Lesson Learned today- For an over achiever like me and a super planner who watches the details, having 2 hours to prepare dinner was actually great. It let me choose what was important to focus on (the salmon) and I had to drop the expectations I usually put on myself. I almost didn’t do my makeup before the guests arrived because I was feeling that casual this evening. It made them feel more comfortable too that the meal wasn’t a well-oiled machine. Too formal and the guests aren’t comfortable. Moving forward, I am always going to include something that isn’t perfect to remind myself that imperfect is more fun- and usually no one notices anyways. In You, O Lord, I put my trust; let me never be ashamed. Deliver me in your righteousness. Bow down your ear to me, deliver me speedily; Be my rock of refuge, a fortress of defense to save me. For you are my rock and my fortress; Therefore, for your name's sake, Lead me and Guide me. Hear my cry, O Lord, attend unto my prayer. From the ends of the earth I will cry to You. When my heart is overwhelmed; Lead me to the Rock that is higher than I. Yesterday I realized just how sturdy large rocks really are. If my God is as big, as strong and as steadfast as this rock is- I serve a powerful God. And though I am a small creature compared to the massive Rock I lean upon, He loves me, He is working on my behalf and He is working in my life even though its not easy. I praise you Lord for this time to rest so completely and securely on You, my Rock and my Fortress. Someone once said I am solar powered. I liked that because there is definitely some truth in it. I can't see it yet, but its raining again. We check the weather carefully at work because it determines how much we will get done that day. Its a pretty good indicator of how much I will get done that day too! The more rain, the more contemplation and thinking I do in between tasks...Sing it Patty Griffin, "Rain". Today. Our God is in Control. I am a plain' ol girl who tries to not be plain at all. 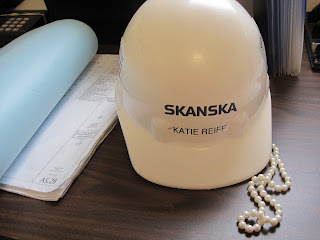 I am first a child of God, then a daughter of my parents, a faithful but sometimes flakey friend, a dreamer, baker, athlete if I try, youth worker, new home owner, and finally but never final, construction project engineer.